"Umtali" redirects here. For steamships of this name, see SS Umtali. 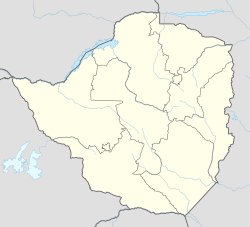 Mutare (known as Umtali until 1983) is the fourth largest city in Zimbabwe, with an urban population of approximately 188,243 and rural population of approximately 260,567. It is the capital of Manicaland province. Although the city was founded in the late nineteenth century, the region has a long history of trading caravans passing through on the way to the Indian Ocean, from ports such as Sofala, to inland settlements, such as Great Zimbabwe. Zimbabwe is also renowned for its soapstone carvings and figurines which are evidence of these trade routes, dating as far back as the late African Iron Age (c. 900 AD) right up to the colonial period. A large hoard of soapstone carvings, jewellery, weapons, sherds and other objects were found in the vicinity of Mutare by the British archaeologist E M Andrews at the beginning of the twentieth century - they were later donated by the trustees of Cecil Rhodes to the British Museum in 1905. The soapstone figures, which are both anthropomorphic and zoomorphic, might have been part of a votive offering, as they were discovered near what appeared to be an altar. Mutare was founded in 1897 as a fort, about 8 km from the border with Mozambique, and is just 290 km from the Mozambican port of Beira, earning Mutare the title of "Zimbabwe's Gateway to the Sea". It is sometimes also called "Gateway to the Eastern Highlands". Many Zimbabwean locals refer to it as 'Kumakomoyo' (place of many mountains). There is a border railway station on the railway line from Harare to Beira with a railways mechanical workshop. The area was the site of Chief Mutasa's kraal. In 1890 A. R. Coquhoun was given concessionary rights and Fort Umtali (the fort later became Mutare) was established between the Tsambe and Mutare Rivers. The word mutare originates from the word 'Utare' meaning iron (or possibly meaning gold). The name was probably given to the river as a result of gold being discovered in the Penhalonga valley through which the Mutare River runs. In 1891 the location was moved to a site now known as Old Mutare, about 14 km north of the city centre. In 1896 the construction of the railway between Beira and Bulawayo led to the town being moved a third time so that it was closer to the railway line – compensation was paid by the British South Africa Company to the townspeople for the cost of moving. The town was proclaimed a municipality on 11 June 1914 and in 1971 it was granted city status. The name was officially changed from Umtali to Mutare in 1982. The white population in Mutare dropped from 9,950 in 1969 to 8,600 in June 1978. The city had a tramway from January 26, 1897 to May 23, 1921 which transported passengers from the Railway station up to the (then Umtali Club) now Mutare Club. The Tramway was at the centre of Main Street where the palm trees now stand. There were plans to set up a Stock Exchange in Umtali. The main post office was at the site where CABS centre now stands. Despite its tropical location, the city has a humid subtropical climate. The average annual temperature is 19 °C, surprisingly low for its moderate altitude (about the same as Harare which is 360 metres higher.) This is due to its sheltered position against the mountain ridge of Cecil Kop which encourages cool breezes from lower altitude to the east and south. The coldest month is July (minimum 6 °C and maximum 20 °C) and the hottest month is October (minimum 16 °C and maximum 32 °C). The annual rainfall is 818 mm. Rain falls mostly in the months December to February although heavy showers are possible before and after this period. The wettest month on record was January 1926 which received 580 mm while January 1991 received only 24 mm. The town lies north of the Bvumba Mountains and south of the Imbeza Valley. Christmas Pass is a mountain pass that leads into the city from the west. The pass was so named by some of the colonial pioneers who camped at the foot of the pass on Christmas Day 1890. Mutare is home to Edmore Mukwindidza,the Mutare Museum, the Utopia House Museum dedicated to Kingsley Fairbridge, the National Gallery of Zimbabwe, Murahwa Hill, known for its rock paintings and Iron Age village, Cross Kopje with a memorial to Zimbabweans and Mozambicans killed in World War I and a nature reserve Cecil Kopje and Tigers Kloof. The Mutare Boys' High Chapel was constructed in honour of former Old boys who perished in World War II, situated on a hilly knoll at Mutare Boys High (then Umtali Boys High). Mutare is served by rail with daily passenger and freight links to the towns of Nyazura, Rusape and Harare. There are two small aerodromes; the smallest is at Mutare Provincial Hospital a very small light aircraft strip for emergency evacuation (now defunct) and a light plane aerodrome in Sakubva near Mutare Teachers College. There is yet a third airport which was constructed in Chiadzwa to carry diamonds for processing in Harare. In 1965, Mutare had a population of 46,000. The racial makeup was split between 36,100 black Africans, 560 Asiatics, 340 Coloureds, and 9,100 whites. The population is predominantly Shona, the majority of them speaking the Manyika dialect. Manyika people are locally known as Samanyikas. According to the 2012 census data, Mutare has a population of 260,567. This marks a rapid increase from a population of 69,621 in 1982 and 131,367 in 1992. Mutare, like most cities in Zimbabwe, classifies residential suburbs according to the population density. The most upscale suburbs (low-density suburbs) such as Murambi, Hillside, Fairbridge Park (named after the founder of the present site of Mutare), Morningside and Tiger's Kloof are located on the north end of the city along the foothills. Low to medium density suburbs Palmerston, Darlington, Greenside, and Bordervale are east of the city center, near the border with Mozambique. In the west are the medium-density suburbs of Yeovil, Westlea and Florida (and Train Houses), as well as the high density suburb of Chikanga, which was constructed in phases (Phase 1; 2; 3) beginning in the late eighties. Further west of Chikanga lies the Garikai/Hlalani Kuhle and Hobhouse. South of the railway track lies the high-density suburb of Sakubva, which contains nearly half of the city's population despite an area of less than four square miles. Sakubva is considered to be the poorest of Mutare's suburbs, and its economy is centred around a large outdoor food and flea market-and the "Musika weHuku" (The chicken market). A few miles to the south, hidden from view from the rest of the city by a series of hills, is the high-density suburb of Dangamvura. The low-density areas of Weirmouth (Plots) and Fern valley are also on the southern outskirts of the city; in these areas residential lots exceed an acre, and market gardening is an economic activity. In fern valley there is also the new state university, Manicaland college of applied Sciences. Further to the south along the road to Masvingo and outside the city limits is the high-density town of Zimunya. Mutare's main industrial areas are south of the railway and west of Sakubva, although there is also some light industry just east of the southern part of the city centre at "Greenmarket" and surrounding areas. These are some of the suburbs of Mutare. Northern (North of the railway line) Murambi;Fairbridge Park; Morningside; Tiger's Kloof; Palmerston; Avenues; Utopia; Darlington; Greenside; Greenside extension (built on former border security zone) Yeovil; Westlea; Florida, extension; Chikanga Phases 1,2 and 3 (Formerly Norris Farmland); Toronto; Bordervale. There are a number of private colleges around the city. Manicaland College of Applied Sciences - an outfit of Midlands State University. The main activities of the area are citrus farming, mining - the city's name is derived from "metal" - and forestry. Two of the largest food producers in Zimbabwe, Cairns Foods and Tanganda Tea, operate in Mutare. Mining includes gold at Redwing Mine, Penhalonga and some smaller mines, diamonds in Marange and gravel quarries around the city. There are a number of forestry companies including The Wattle Company, Allied Timbers, formerly FCZ, Border Timbers and Timcon Investments. The main timber products include rough sawn timber, wattle bark, charcoal, various doors and frames and mouldings. The major timber produced is pine, sydney blue gum, black wattle, and some hardwoods on a smaller scale. Tino Mawoyo, Zimbabwean cricketer, born and raised in Mutare. ^ Thatcher, Gary (15 January 1980). "Rhodesia city skeptical as border opens". The Christian Science Monitor. Retrieved 3 December 2017. ^ "World Weather Information Service – Mutare". World Meteorological Organization. Retrieved 25 October 2015. ^ Official South African Municipal Yearbook. S.A. Association of Municipal Employees. 1966. p. 301. Wikimedia Commons has media related to Mutare.